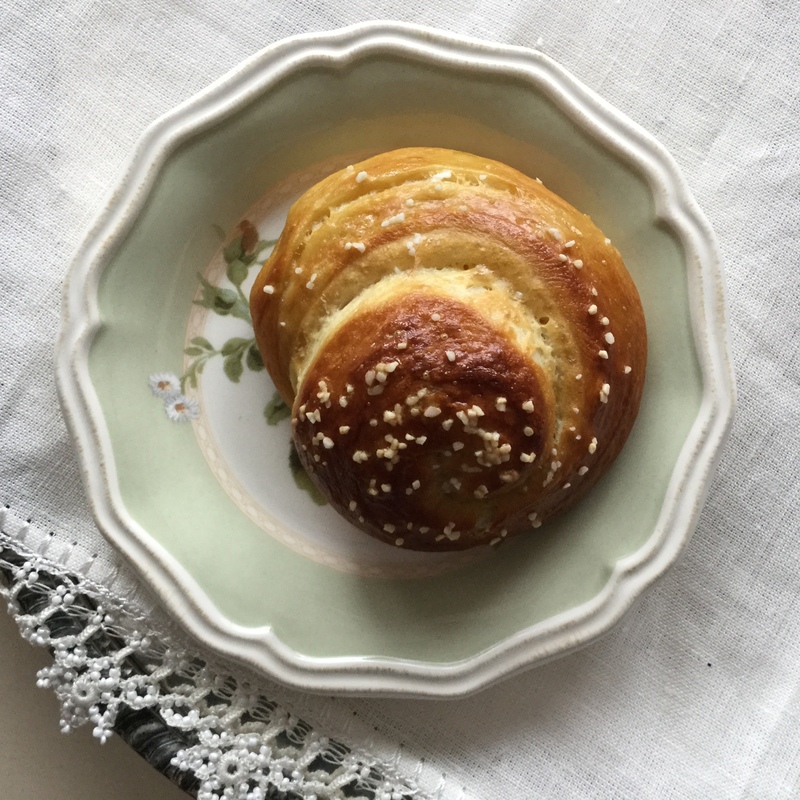 My mother had made soft pretzels when we were young and they were always a treat so a few years ago I started making soft pretzels and pretzel rolls. The nice thing about the rolls is you can eat them as a pretzel treat, a sandwich roll or as a dinner roll. This recipe makes 8 rolls so I always quadruple the recipe, then you can share some and freeze some for later. The original recipe I found in the Food Network magazine. Warm the milk in a small saucepan or microwave until a thermometer registers 1100. Pour into a medium bowl; sprinkle with the yeast and let soften, about 2 minutes. Sprinkle with the sugar and set aside until foamy, about 5 minutes. Combine the flour and fine salt in the bowl of a stand mixer fitted with the dough hook. With the mixer on low speed, add the yeast mixture and butter and mix until the dough is slightly smooth and soft but still sticky, about 2 minutes. Coat a large bowl with cooking spray; add the dough, cover with plastic wrap and let rise at room temperature until doubled in size, about 1 hour. Generously coat a baking sheet with cooking spray (I use parchment on my baking sheet). Turn the dough out onto a lightly floured surface. Stretch into a 16-inch-long log, about 2 inches wide; cut into 8 even pieces. Since I made 4 batches I divide the dough into four first. Transfer the rolls to the baking sheet and cover with plastic wrap. Let rest at room temperature 15 minutes, then refrigerate until slightly puffed, about 2 hours. Preheat the oven to 4000. Fill a large pot or deep skillet with 3 inches of water. Add the baking soda and bring to a boil. Add half of the rolls and cook until slightly puffed, about 1 minute, flipping halfway through with a slotted spoon. I find it easier to place them in the water face down, then flip them so they are face up and can be easily lifted out of the water onto the pan. Return the rolls to the baking sheet and repeat with the remaining rolls. Brush the rolls lightly with the beaten egg, then sprinkle with coarse salt. When I bake them I usually eat a few and give a few away. I freeze whatever is left in a single layer in a zip lock bag. It is nice to pull them out as needed and warm them in the oven. They keep nice for a month in the freezer. My Godson Gavin stopped in with his mother for one of his favorite snacks. They are not work when you know others will enjoy them. I hope your family and friends will also enjoy this recipe. Thank you, I think you will enjoy them!